The U.S. government’s October 2017 lifting of its comprehensive economic and financial sanctions on Sudan has created the impression that the Sudanese regime of President Omar al-Bashir is evolving into a reliable partner and no longer poses a threat to the national security and foreign policy interests of the United States. This impression is deeply misguided. New circumstances have emerged in Sudan that make U.S. efforts at full normalization dramatically ill-timed. This report attempts to explain those dynamics. If the United States persists in laying out a path to normalization despite the poor timing, below are a series of incentives, pressures, and benchmarks that could potentially contribute to a more constructive process. Through forthcoming talks with the United States, the Sudanese regime seeks its removal from the U.S. State Sponsors of Terrorism list, one of the last remaining forms of U.S. sanctions on Sudan. This is significant because it would allow Sudan to seek debt relief at a time when its economy is imploding. Yet, as the Sudan government continues its inconsistent charm offensive aimed at U.S. policymakers, serious concerns linger about Sudan’s true commitment to the fight against international terrorism, its disruptive and erratic foreign policy that includes recent overtures to and military agreements with Russia, its continued role as a regional destabilizer, and its ongoing repression of its people and persecution of minority religious groups, including Christians. As the planning for the next phase of bilateral talks progresses, Sudan has entered a new moment where its spiraling economic crisis, brought about by decades of grand corruption and inept economic policymaking, has come to a head. To accelerate normalization while there is rising evidence that the crumbling economy and increasing government repression are seriously deepening internal fissures within the regime would be severely ill-timed. The regime will need to undertake fundamental reforms to save the country from the consequences of its own kleptocracy. Failure to do so will condemn Sudan to state failure and trigger further regional turmoil and destabilization. ● Khartoum maintains warm relationships domestically with groups that advocate violence and have destructive, intolerant, extremist religious ideologies. Such relations put U.S. persons and interests in Sudan, and globally, at great risk as some recent incidents documented below make abundantly clear.● Over the past year, the Sudan government has continued to repress Christians and moderate Muslims including through the repeated detentions of priests and churchgoers and the demolition of churches, the most recent a 64-member evangelical church in Khartoum. The government also singled out for harassment and detention rights activists who stood up for the freedom of religion. ● The movement of weapons, ammunition, and armed criminal actors from Sudan across the Sahel threatens regional security in Chad and the Central African Republic. ● The Sudanese regime reported it made offers in late 2017 to both Russia and Turkey of military alliances and services in the form of naval bases on its Red Sea coast risking further destabilization of the Middle East and Horn of Africa as well as alienating Gulf countries allied with Egypt. These offers, and subsequent Russian military sales, reveal the hostility and distrust that President al-Bashir has for the United States at a time when his regime is engaged in an attempt to remove itself from the U.S. State Sponsors of Terrorism list. At this writing, different offices within the Trump administration are preparing elements to include in the roadmap that they will eventually present to Government of Sudan officials outlining the commitments and benchmarks they expect the regime to make and implement to prove its eligibility for the lifting of remaining sanctions and removal from the terrorism list. As they reconcile their demands for the regime, these U.S. policymakers should fully take into consideration that this is the same regime that has designed and executed what two previous U.S. administrations have called “genocide” against the people of Darfur, and the same regime that has bombed and starved populations for years in Blue Nile and South Kordofan states. These depredations continue, though they have lessened as the strategy to kill and displace the populations where opposition exists has led to a decisive military advantage for the government and much less resistance by fragmented rebel factions. Addressing Sudan’s designation as a state sponsor of terror would therefore have to also address the multifaceted domestic terrorism of the regime and seek to encourage permanent solutions to Sudan’s many internal wars. ● The regime continues to wage war against minority communities in its conflict areas of South Kordofan, Blue Nile, and Darfur states. Both parties’ current, unilateral cessation of hostilities declarations encouraged by the five-track policy could give way to the resumption of hostilities particularly if the regime felt unhampered by international scrutiny.● The granting of humanitarian access to the former “Two Areas” has yet to happen, obstructed most recently by the failure of the government and the new leadership of the Sudan People’s Liberation Movement-North (SPLM-N) in early February talks in Addis Ababa mediated by the African Union High-Level Implementation Panel for Sudan (AUHIP) to agree on the details of a humanitarian cessation of hostilities in isolation from their respective political demands. ● Further, the regime continues to display ambiguous ideological stances that dent its credibility as a partner in counterterrorism as evidenced by its ties to religious extremists. 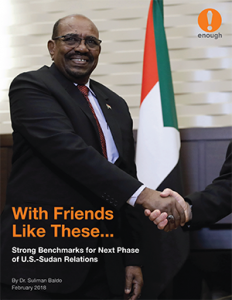 U.S. policymakers presently charting the course of U.S. engagement with Sudan for the next phase of the normalization process should maintain levers of pressure on Khartoum, employing a combination of incentives and financial pressures. As they consider potential incentives for the regime—possibly including normalized bilateral relations, removal from the terror list and support for Sudan’s debt relief, increased trade promotion activities, and appointment of a full U.S. ambassador—U.S. officials must hold Sudan to account for egregious rights violations, serious security threats, grand corruption, disastrous economic mismanagement, and risks to regional stability. Such pressures should include actions that can be taken in the short term and not only deliver clear messages to Khartoum, but also have demonstrable impact on the networks tied to the Bashir regime. These actions should seek to warn U.S. and other businesses that may be considering entering the Sudanese market following the removal of sanctions that this may not be advisable in the current environment without extensive due diligence. 1. Issue sanctions designations of Sudanese spoilers, particularly officials responsible for serious human rights abuses and corruption, pursuant to Executive Order 13818. The U.S. government has demonstrated a willingness to designate senior officials and their companies in other countries under this authority, and it can deliver similar actions against key members of the Bashir regime. The leadership and business network of the National Intelligence and Security Services (NISS) should be key targets, given that the NISS is a key entity at the intersection of both human rights abuses and systemic corruption.2. Use the long-moribund Darfur sanctions authorities, pursuant to Executive Order 13400, to designate officials responsible for instability and abuses in Darfur and neighboring areas. This sanctions authority has—disturbingly—not been used since 2007, even though most of the millions of Darfuris displaced before 2007 and since remain displaced or in refugee camps. These sanctions must be revived and used to designate not only officials, but their broader business networks which undermine peace and security in the country. 3. Issue an anti-money laundering Advisory focused on concerns with gold mining and export in Sudan. Gold has become the Sudanese economy’s leading commodity, and Sudan is an increasingly significant global gold producer. In light of government attempts to control the sector and its reported connections to conflict, the potential for Sudanese gold to be connected to money laundering is material, and the U.S. Department of the Treasury’s Financial Crimes Enforcement Network (FinCEN) and other financial intelligence units should warn financial institutions about these issues. 4. Balance efforts to encourage U.S. companies and banks to engage in Sudan with clear and direct warnings, including through statements and direct meetings, about the ongoing risks, particularly about doing business with individuals or entities connected to NISS. The regime’s long history of grand corruption and favoritism has in effect undermined the business and investment environments. 5. Go beyond warnings and use the authority of Executive Order 13400, which allows for sanctions designations against those stoking conflict in Darfur, to require U.S. companies doing business in Sudan to report publicly on the enhanced due diligence undertaken to ensure their activities do not connect to conflict, corruption, or other concerns in Sudan. This type of reporting was required as the Burma sanctions were eased, and a similar model should be used in Sudan.